The US and three major European nations are to postpone moves to refer Iran to the UN Security Council over its nuclear programme, diplomats have said. The UN nuclear watchdog, the IAEA, is due to meet in Vienna on Thursday. Iran's parliament voted on Sunday to end co-operation with UN inspectors and press ahead with uranium enrichment if it is referred to the Security Council. Tehran insists its nuclear programme is for civilian energy only, but the US fears it could be used for weapons. Diplomats close to the negotiations said Iran would be given more time to consider a compromise that would move the most sensitive part of nuclear fuel production - uranium enrichment - to Russia. Under the plan, Iran would be allowed to engage in uranium conversion, but Tehran has resisted the proposal since it was first mooted two weeks ago. Tehran argues that it has a legitimate right to peaceful nuclear technology. Any eventual referral to the Security Council could lead to economic sanctions. "There will be no resolution for sure. The Russians and Chinese oppose this," one EU diplomat told the Reuters news agency. 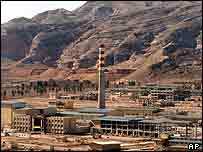 Direct negotiations with the US and the EU - the UK, France and Germany - broke down in August when Iran resumed converting uranium into gas form at a plant in Isfahan. In September the IAEA's board called on Iran to cease all nuclear fuel work, and threatened to refer Tehran to the Security Council. An interim report last week revealed that Iran had information on how to build a key part of an atomic weapon from the network of disgraced Pakistani nuclear scientist AQ Khan. Iran insisted it neither requested the information nor used it. The disclosure heightened concerns among some IAEA members that over Iran's processing activities. Tehran announced last week that it had begun processing a new batch of uranium, which can be used in a weapon in a highly enriched form. The country's nuclear negotiators have regularly said they want to re-start enrichment, but have so far held back from unilateral moves.